What is it like to work for CIR? Here is the first of a series of interviews with CIR employees to see what goes on behind the scenes. First in the series is Kelle Green, CIR's Nursery Manager. With this year’s rain, it’s looking like it’ll be a great year for wildflowers! Blankets of poppies and lupine, pockets of monkeyflowers, lilies, and fiesta flowers, rare stream orchids and Humboldt lilies, and more can be found all throughout the Central Coast - but the question is, where? We are glad to announce that Friends of the Island Fox (FIF) is joining the CIR family. FIF is a group which supports efforts to preserve and protect the island fox (Urocyon littoralis) on the California Channel Islands through conservation and education programs. FIF became a key component in the efforts to help restore the number of island foxes when they were threatened with extinction. Today, Island Foxes throughout the Channel Islands are no longer endangered, which is thanks in part to the help of FIF and their supporters. Now FIF will continue their conservation efforts as a program of CIR. Should Dogs Be On Leashes in a Wildlife Preserve? Many people enjoy hiking in our local natural areas, and a lot of those people bring along their furry, four-legged canine friends to join them in the experience. 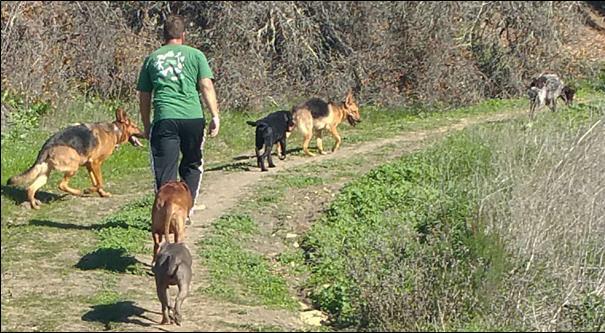 In recent years, "off-leash" recreation has become popular, and many parks and open spaces allow dogs to run free without a leash. Where laws require leashes, enforcement is often spotty, and many people simply ignore the law. Channel Islands Restoration has become the new Project Manager for habitat restoration and stewardship at the San Marcos Foothills Preserve (SMFP) which is located between Santa Barbara and Goleta. 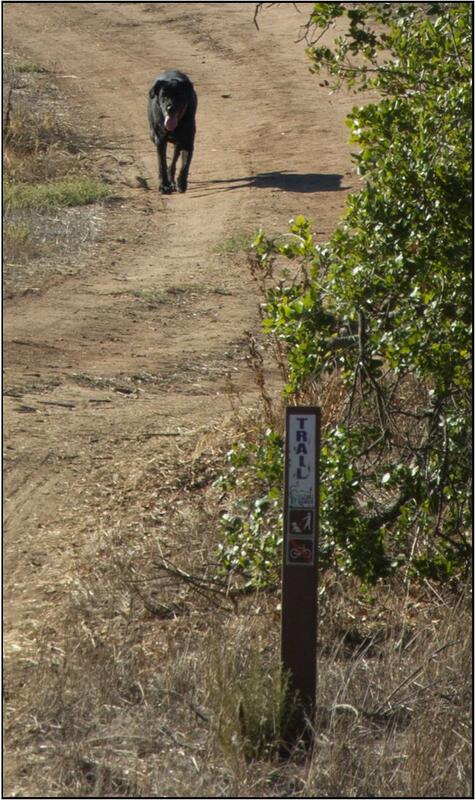 We have been struggling with the issue of dog-owners who refuse to leash their pooches while visiting the Preserve. We are interested in your view about how appropriate leash laws are in open spaces that contain a lot of wildlife, particularly in wildlife preserves. In 2010, CIR began working with the County of Santa Barbara to restore habitat at the SMFP. Since then our role has expanded to include stewardship and education. The Preserve had been donated to the County to ensure that the property would be preserved as open space for its biological, scenic and archaeological resources. All this came about after years of advocacy by conservationists, who saved the property from development with the idea of conserving it as a primary goal, but also allowing for low-impact recreation that would be friendly to the wildlife. As many as 43 rare or threatened species may be found on the Preserve, including nesting birds and other animals that are vulnerable to disturbance by pets. Birds can abandon their nests if disturbed by people or pets that wander off the trails. Nesting animals often hide in shrubs or grassy areas very near trail edges. A curious dog can easily find and disturb these animals, and the encounter may result in a missed opportunity for that animal to breed. This happens more often than most of us know, and the consequences are measurable: the number of birds are in steep decline in many areas, including at the SMFP. Off-leash dogs also face dangers from wildlife. We know of two coyote attacks on dogs that were walking off-leash in local open spaces (including at the SMFP) and one of these attacks ended up in the death of a beloved pet. The SMFP also has a large rattlesnake population, and uncontrolled dogs are very vulnerable to snake bite. CIR has been working with the County to educate visitors at the SMFP about why dogs should be on leashes. Our message: the laws are not arbitrary, and they are mostly designed to protect wildlife. We have posted flyers at the Preserve, and also included information on our web page. The County has posted additional signage making it clear that leash laws are in force. 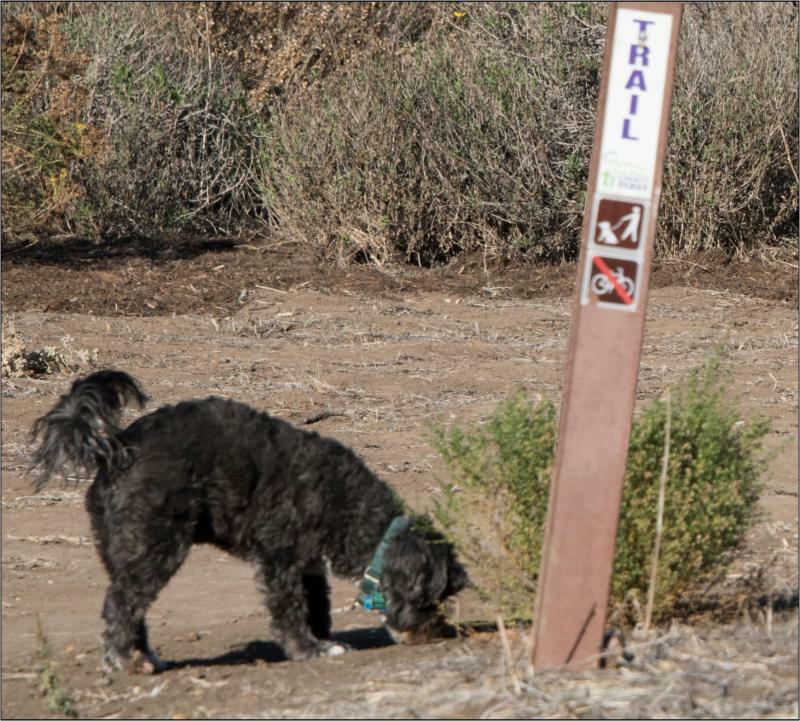 Still, most pet owners who visit the Preserve act as if it is an off-leash dog park (there are six parks that are officially designated as off-leash in the Santa Barbara area). As a result, the County ranger has been issuing tickets, which has caused outrage by many of the pet owners. We would like to hear from you about this issue! Do you think it's reasonable to require dogs be on leashes in wildlife preserves like the SMFP? Considering that there are many parks and open spaces that allow off-leash dog-walking, should the leash laws elsewhere be enforced? We know that people have a variety of opinions on this subject, and we would like to hear from you no matter what you think (we will keep your comments confidential). Who Helps CIR When We Donate Our Time? Who helps fund the un-fundable restoration projects, the orphan projects and the important environmental and education work even when limited and short-term grant funding runs out? CIR volunteers remove fennel (Foeniculum vulgare). NPS to keep it from spreading. Channel Islands Restoration continued working on Santa Rosa Island this year, in a project funded mostly by CIR donors and our volunteers with support from the National Park Service (NPS). We held four trips in 2013 to remove fencing, plant natives, remove invasives and to work in the native plant nursery. The fencing had been erected to protect sensitive plants and habitats from browsing and trampling by non-native grazing animals. Since these animals are no longer on the island, the fencing is now an unnecessary eyesore and a potential hazard to visitors and native animals, so it is now a priority to remove it. Often located in remote areas difficult to access, the fencing can be a challenge to remove. (a native succulent) at China Camp on the island’s southwest side. Although volunteers put in long hours, they also had the opportunity to visit parts of the island that are not easily accessible. Although removing the fencing and the restoration work are priorities for the NPS, budgets are tight, so there is no funding to pay for these projects. nursery on Santa Rosa Island. CIR developed a program where volunteers paid for a portion ofthe needed funding, CIR paid for the rest, and the NPS provided staff support, on-island transportation and camp sites. While CIR spent more than $5,000 on the four trips, this project would not have happened without the generous support of volunteers and CIR donors. Volunteers camped at the NPS campground at Water Canyon, and on one occasion, stayed at the bunkhouse that housed island ranch hands when the island was privately owned. The bunkhouse is now part of a new research station run by California State University Channel Islands, and CIR is grateful that we received special permission to stay there. CIR volunteers use special jacks to remove fence posts at East Point. Volunteers also remove invasive iceplant at East Point. NPS Restoration Ecologist Sarah Chaney shows volunteers the work location near Carrington Point. Volunteers removed fencing at the work site, which was located several hundred feet below the pictured location. Volunteers from REI volunteer for CIR on Anacapa Island. Since Channel Islands Restoration regularly started working with volunteers in 2002, a total of 6,273 people have volunteered for our program on nearly fifty projects on the Channel Islands, and at many mainland locations. At a recent social event held in appreciation of CIR supporters, Executive Director, Ken Owen, reviewed CIR’s history and directly attributed our success to the tremendous support of our volunteers. CIR has grown from a two-person volunteer operation centered on an invasive tree removal program on Santa Cruz Island, to a full-service environmental restoration and education non-profit organization with ten employees. We have worked on all eight of the Channel Islands and have projects in dozens of mainland locations, from Orcutt in the north, to San Pedro in the south. CIR founders Ken Owen and Duke McPherson met on Santa Cruz Island and quickly realized they shared a passion for the unique native habitat of the Channel Islands. with the Restoration Club from U.C. Santa Barbara to remove invasive plants, particularly Eucalyptus trees. Later, Ken joined Duke on his small speed boat to regularly visit the island on multiple volunteer trips that took place over several weekends a month. This evolved into a larger program after Ken began recruiting volunteers for the project. The Nature Conservancy provided equipment, the National Park Service provided boat transportation and the U. C. Santa Barbara, Santa Cruz Island Reserve provided housing and pick-up trucks to help facilitate the volunteer work. Near the end of 2002, Kate Symonds with the U.S. Fish and Wildlife Service arranged for grant funding for the project. Duke and Ken initially formed CIR as a partnership, and it was at this time that the Santa Cruz Island project had become a professional operation. Ken provided volunteer coordination and trip logistics, and Duke contributed his many skills as an arborist and professional contractor. Although the program had expanded into regular monthly trips with large volunteer groups and grant funding, CIR was still very much the “Duke and Ken Show,” as some people began calling it. It would be several years before CIR needed to hire employees, because Duke and Ken could rely on the help of hundreds of volunteers a year. This made for a very economical operation, and the grant funding that was supposed to pay for twelve trips, lasting just a year, actually paid for almost double that. In 2005, the first of many school groups began working with CIR on Santa Cruz Island. That same year, David Chang from the County of Santa Barbara, hired CIR to work on two important invasive plant removal projects. One was on Santa Rosa Island, where CIR led volunteer groups surveying for, and removing a thistle listed as a “noxious weed” by the State of California. This multi-year project marked the first time CIR worked outside of Santa Cruz Island. In later years, CIR led volunteers to plant natives on Santa Rosa and to install fencing around sensitive plants to protect them from grazing by non-native deer and elk. Recently, CIR has been removing this fencing now that the non-native animals are gone. We also work in the island nursery, and we continue to plant natives.
) from three miles of the Carpinteria Creek watershed with the California Conservation Corps. This was the first time that CIR was hired to work on a mainland project. from the Refugio Creek watershed. The following year, CIR hired employees to help with that project, including Kevin Thompson, who later became the CIR Operations Manager. The Arundo removal at the Carpinteria and Refugio watersheds (plus others that followed) were large-scale projects requiring equipment, paid personnel and expertise. CIR continued to work with hundreds of volunteers each year, on projects elsewhere, but the Arundo projects were not suited to volunteers. Also in 2007, CIR began taking volunteer school groups to Anacapa and East Santa Cruz Islands in partnership with the “Once Upon a Watershed” program in Ojai. The school program (later funded solely by grants raised by CIR) targeted fourth and fifth graders from schools in low income areas. The funding paid for the cost of bus and boat transportation, plus CIR personnel to lead the trips and to lead the volunteer work. Most of the kids had never been on a boat, or seen marine mammals or even visited a National Park, and they did all of these things on these school trips. Since the inception of the CIR school program, 2,137 students, accompanied by 368 adults have worked with CIR on the Channel Islands! Around the same time, CIR held its first volunteer trip to work with the U.S. Navy on San Nicolas Island. We took a small volunteer group to the island to remove non-native plants. In the last two years CIR has built a nursery on the island, grown and installed native plants, and has expanded the invasive plant removal in cooperation with the Navy. In 2008, David Chang helped CIR raise additional funding from the U.S. Fish and Wildlife Service for expanded work on Santa Cruz Island. The grant funded projects in more than twenty locations on the island and included specialized work with endangered plant species. In 2010, CIR held our first natural history tours. These trips, which were purely educational in nature and did not include restoration work, were immediately popular and successful. We started with a trip to Death Valley National Park and then to the White Mountains of eastern California. Geologist Tanya Atwater and Botanist, Steve Junak have been leading CIR trips to these locations and to other amazing locations ever since. That same year, CIR partnered with Channel Islands National Park (NPS) on an iceplant eradication project on East Anacapa Island. CIR worked with the NPS to build a native plant nursery on the Island, with initial funding from the Ventura Patagonia store and from CIR Board members. Gordon Hart (of the CIR Board) led the construction project with help from other CIR volunteers and NPS staff. Additional funding (arranged by NPS Restoration Ecologist Sarah Chaney) enabled the nursery to be completed. iceplant eradication and restoration of native vegetation on the island. CIR recruited large numbers of volunteers from the general public, and also worked with established groups of volunteers recruited by NPS from local high schools. Regular CIR volunteer trips began on Wednesdays, the normal NPS transportation day for Anacapa. The ongoing work on the iceplant, plus the growing and installing of plants continues. CIR began working with the U.S. Navy on San Clemente Island in 2011. On our first trip, twenty volunteers spent five days pulling iceplant from sensitive habitat on the island. We removed hundreds of patches of iceplant over forty acres, which highly impressed the personnel we were working with from the U.S. Navy and San Diego State University. Since then, CIR has returned to the island to remove iceplant and other invasive plants. We remove some of these invasive plants where they are smothering endangered plant species. CIR staff have also used climbing gear to rappel down steep canyons to remove invasive plants in very remote sections of the island. We plan to increase our work on San Clemente Island in 2014 and beyond. Also in 2011, CIR started working on three important invasive removal and planting projects on the mainland. One was at the San Marcos Foothills Preserve (at two different sites) with funding from the Goleta Valley Land Trust and the San Marcos Foothills Coalition (SMFC). We planted several thousand native plants at the sites, and we continue to work on this project with our volunteers. On one workday, more than 150 people from several outdoor companies volunteered at the Preserve for CIR. Last year we received grants from Patagonia and REI to work in other sections of the Foothills. Recently CIR has started developing a docent program for the Foothills in partnership with the SMFC. By Spring we will be training volunteers to lead hikes at the Foothills that will highlight the ecology and history of this important open space. Another of the mainland projects CIR started in 2011 was along the Andree Clark Bird Refuge at the Santa Barbara Zoo. CIR removed many dozens of invasive trees that were crowding out native habitat along the refuge, which is an important bird nesting area. We also planted several thousand native plants. This ended up being one our most popular volunteer projects, since it is a beautiful place to work and participants were offered free admission to the Zoo after volunteering. On one Saturday, over 100 people volunteered! The third mainland project started in 2011 was along the Santa Clara River near Santa Paula. Working with BioResource Consultants, CIR removed Arundo from about five acres in breeding habitat for several threatened and endangered species. We also installed native plants, spread seed and installed a large irrigation system. CIR has removed Arundo from several locations on the Santa Clara River, but this is the largest site we have worked on there. In 2012 and 2013, CIR continued work on many of the projects discussed above and on many others. We held our first large volunteer trip to Catalina Island, and we plan more trips there in the coming years. In 2014 we look forward to improving our outreach to our many friends who support CIR behind the scenes. This article is based on a PowerPoint presentation shown to our supporters at a recent “CIR Social” designed to thank those who help CIR financially. We present it here, so that the many thousands of people who have volunteered for CIR can also appreciate the journey we have all taken together since Duke and Ken started removing invasive trees on Santa Cruz Island, nearly thirteen years ago. Wayne R. Ferren Jr. has joined the Channel Islands Restoration team as Principal Ecologist and head of the newly formed Research Program, which will expand the scope of CIR to include a broad array of ecological and environmental functions. Wayne brings over 40 years of experience with institutional, non-profit and for-profit botanical, ecological, and environmental programs including employment with the Academy of Natural Sciences of Philadelphia (ANSP), the University of California Santa Barbara (UCSB), and Maser Consulting and the Rancocas Conservancy in New Jersey. Wayne has extensive experience in environmental and programmatic management and oversight. He was Botanical Collections Manager at ANSP, Curator and Executive Director of the UCSB Museum of Systematics and Ecology, Assistance Director of the UCSB Natural Reserve System, Director of Carpinteria Salt Marsh Reserve, Project Manager at Maser Consulting and Trustee at the Rancocas Conservancy. Wayne also has served as President of the California Botanical Society and Editor of Madrono. He has authored over 90 technical papers, reports, and chapters, provided numerous classes, workshops, and presentations; and is the recipient of eleven environmental awards for his work and projects. At CIR Wayne will oversee research elements of restoration projects, environmental monitoring, and field experiments. He will oversee project design; manage the production of technical reports; manage project permitting; and assist with marketing and business development. Wayne also will assist with the development and execution of the Education Program including lectures and field trips. Wayne’s technical focus will include restoration ecology, wetland ecology, plant sciences, and environmental review and planning. Who Pays for CIR Programs? Although CIR staff and volunteer board members spend countless hours writing grants to many different funding agencies, much of the work that we do is completely unfunded by any agency. In these cases, CIR relies on individual contributions to help carry out these important projects. As an example, CIR board members and other individual donors raised a big portion of the funding needed to purchase and construct a shade house on Anacapa Island as part of the nursery project there. Although we are glad to work with our partners in the Park Service and Patagonia to help fund the nursery, individual donors helped make that project possible. Also, CIR regularly contributes staff time (and the associated wages) so that adults can volunteer on the Channel islands. Contributions from CIR supporters help fund these types of projects. Funding is often available for targeted schools to work with us on the Channel Islands, but many other schools must raise the money for the boat and other costs. In those cases, CIR often donates the pay for our staff person to join the group and lead them in a restoration project. Although CIR is a non-profit organization, we still need to pay the costs of doing "business" like for-profit companies. The difference is, we operate on a near break-even basis, and we work on many projects because of their ecological or educational value and not their monetary value. CIR is required to pay considerable overhead expenses in order to work on our restoration projects. These include workers compensation and liability insurance, accounting fees, rent for equipment storage and an administrative office, equipment purchases and maintenance, and staff time to administer a wide-ranging and busy organization. As a percentage of our budget, these expenses are relatively low, but there is no funding available to pay for these costs other than contributions from our supporters. We are always proud to announce that we have received grants from foundations or other agencies, but it is important to remember that CIR must raise a great deal of our funding from individuals to keep operating. That is why we ask for contributions, and we hope that people who support our work will also support us financially. Also, if you've never seen the Santa Cruz Island "Eagle Cam" you should check it out! Especially when there are eggs and chicks in the nest, it's one of the most popular web cams on the internet!
) adding a powerful social media component to or organizing capability. We have been using a huge email list and an extensive web page to communicate with volunteers since the year 2000, but our Facebook page has only recently become a relevant component of how we recruit volunteers for habitat restoration projects. Facebook is attracting new people to our organization, and we plan to use the page to post news and interesting features about the islands soon. Just 20 year ago, non-profits would use written newsletters and phone trees to publicize events. Now we can use the web, email, blogs Facebook and soon Google Plus to reach volunteers. Using these tools to their fullest extent can be rather time consuming, but we are able to reach thousands of people quickly and at short notice. As popular as CIR is with the public, attracting fans to our Facebook page requires a little finessing. Earlier this year we publicized the page to our email list (of nearly 1,100 people) which provided an initial surge of fans to the page. We also created a custom "landing page" so that people who visit the page for the first time see an attractive graphic urging them to "Like" us and learn more about the organization. Links to the Facebook page can be found on our of our promotional materials, including business cards, brochures and on our web page. We look forward to adding more fans in the future, and we plan to use the page for more than just announcing volunteer opportunities. Watch the page for interesting news and tidbits about all eight of the Channel Islands and about environmental restoration in general. We started a new project at the Conejo open space near Thousand Oaks. They have a great volunteer program, and they asked CIR to help with some specialty weed eradication and we also recruited some of our volunteers to help. We should announce some other volunteer days in the near future. CIR also began a project at More Mesa in Goleta, as part of the replacement of the large staircase from the mesa top to the beach. The County of Santa Barbara required that the invasive iceplant and Myoporum trees at the site be replaced by natives, and CIR has been hired to assist with this aspect of the project. Rein Teen Tours joined us at our San Marcos Foothills and Lake Los Carneros projects last week. Rein is a tour group, consisting of mostly high school aged kids from the East Coast. They spend several weeks in California doing many activities, including service work for non-profits. This is the fourth year CIR has worked with them. Work continues at the San Marcos Foothills sites. Although planting is finished for this season, we continue to irrigate our native plantings. Weeds tend to sprout up where we apply water, so we will still be calling on volunteers for help providing love and care to the great native plants now growing in what used to be weed patches! Watch your email for announcements about volunteer days. Starting around November, we will do a second round of planting at both sites in the Foothills. More than 25 people came to our presentation on the White Mountains in Ventura earlier this week. Dr. Tanya Atwater provided a super PowerPoint on the plate tectonic history of Southern California and the geology of the White Mountains. Ken Owen showed a presentation on "ecological islands" (ecosystems surrounded by unlike ecosystems) like high mountains surrounded by desert. Twenty eight people have signed up for our White Mountains trip that will start on Thursday.